Clear Resin is in the Form Store! 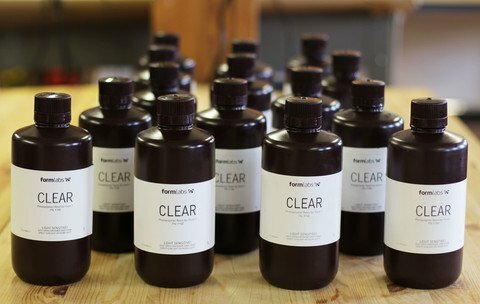 Today we're excited to offer Clear Resin for sale at the Form Store for $149 per liter. To make it easy for you to stock up, you can purchase more than one bottle at a time, and we'll consolidate up to four in a box. We will also consolidate up to three additional bottles of Clear Resin for those of you who wish to purchase more on top of the liter already included with the Form 1. We will prioritize resin shipments to customers who have already received their printer, or soon will. Kickstarter backers, in appreciation of your support early on, you will be able to purchase at least one bottle of resin for $129 each month, as promised. We will send you a personalized discount coupon to use in the Form Store. You'll be able to use the coupon three times over a three month period before it expires. Every three months we'll send you a new coupon, so keep an eye on your e-mail for the coupon and more information. We hope you enjoy Clear Resin and we can't wait to see your amazing prints. Make sure to show off your creations on our community website.